Scrapi-Hapi-Licious ME: My Precious Son - Revamp! I believe this will be the last revamping I will do for this year because I really have to work on with our Christmas decorations here at home. So many ideas in my brain but I need to narrow it down. First of all I have to have a final decision on what Christmas theme we're having this year. My son has been asking me almost everyday and I couldn't give him a definite answer ... yet. Well, I still have this day to make a final decision then create then decorate. Everything has to be up by December 1, which reminds me it is also hubby's birthday. I just love the revamp layout and it really made me smile =) The little boy climbing the tree is a cut from My Community Cricut Cartridge and the sentiment "Great Boy" is a cut I made using Graphically Speaking Cricut Cartridge. Good luck with the decorations! I have to start conceptualizing our decors for this year too. 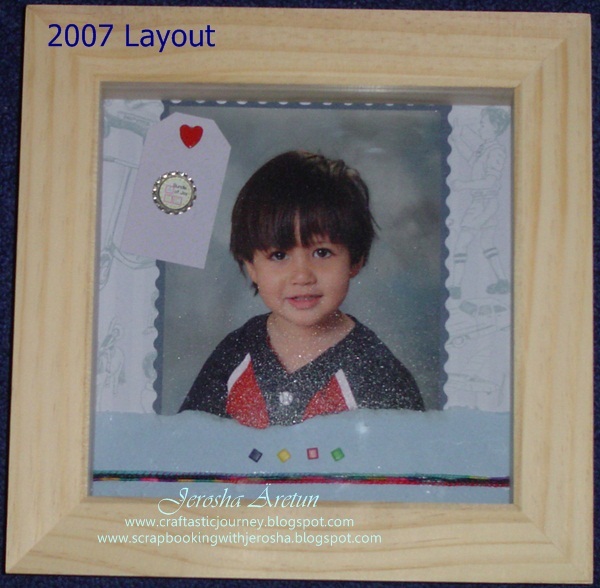 I started scrapbooking latter part of 2006 so I really had limited tools and materials at that time. That's Joseph's first pix from pre-school. he is really cute!!! -ang sarap namang ikiss!! !